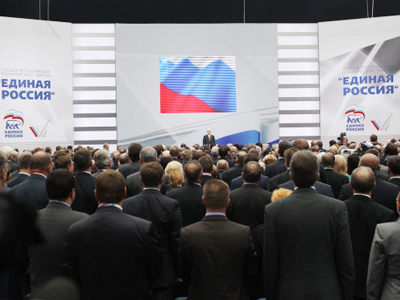 The United Russia party convention has unanimously voted to nominate its leader, Vladimir Putin, as its presidential candidate for the March 4 elections. The ruling party held the second part of its pre-election congress on Sunday, November 27, after the upper house of the Russian Parliament on Friday officially approved March 4 as the date for presidential elections, triggering the presidential race. "Russia needs a leader – courageous, powerful and clever, capable not only of defending the rights and freedoms of citizens, but also of reminding them all of their obligations and making them fulfil them, first and foremost, the most sacred duty of observing the laws of the Russian Federation. And we have such a person – Vladimir Vladimirovich Putin," film director Stanislav Govorukhin said at the opening of the convention as he commended Putin's candidacy. Putin has already been elected president twice, in 2000 and 2004. As Russia has recently lengthened the presidential term, the winner of the 2012 election will take up the post for six years, with the right to stand for a second six-year term. 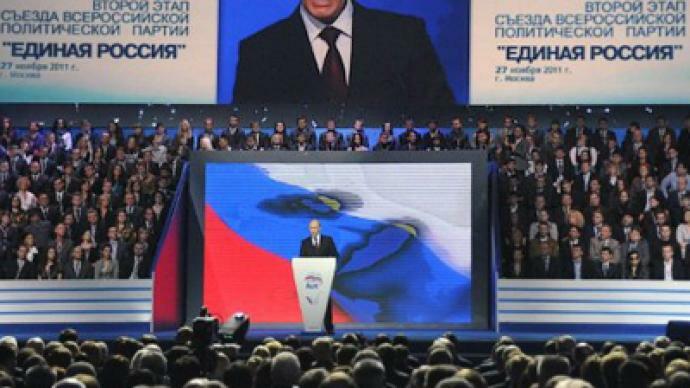 The decision to nominate Putin, who is Russia’s current prime minister, was also supported by delegates of the Popular Front – a new organization bringing together supporters of Putin and United Russia. 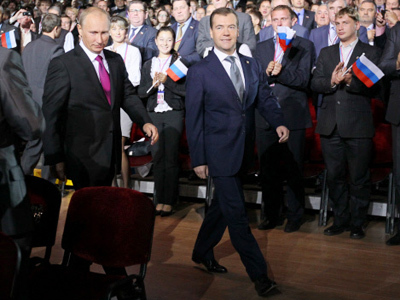 Putin’s candidacy, however, was decided much earlier during the first part of the convention in September when incumbent President Dmitry Medvedev endorsed Putin as United Russia’s candidate. At the same convention, Putin said that he supported Medvedev as number one on United Russia’s list at the parliamentary elections due on December 4. Several other Russian politicians have also declared their presidential ambitions. The Communists are to make their final decision at the party congress on December 17. First deputy chairman of the party, Ivan Melnikov, confirmed in an interview to gazeta.ru that Zyuganov is the most likely nominee. “…First of all, I reiterate, he is the best-prepared person for fulfilling the duties of President of the Russian Federation,” Melnikov explained. “And also because we are taking part in the vote not just for the sake of participating, but in order to win,” he concluded. Zyuganov ran for president in 1996, 2000 and 2008, coming second each time. Another veteran of Russian politics, the eccentric head of the Liberal Democratic Party (LDPR), Vladimir Zhirinovsky, voiced his plan to run for president back in the spring, shortly after the Communist leader. He confirmed that the LDPR would certainly take part in the presidential vote in March 2012 since a party which does not participate in the elections indicates its weakness. Grigory Yavlinsky, chairman of the liberal Yabloko party, might join the race, but only if his party gets from 5 to 7 % of the votes at the State Duma poll on December 4. Currently, Yalboko is not represented in the Russian parliament. The second condition would be his official nomination as presidential candidate by Yabloko. Like his potential rivals,Yavlinsky is not new to politics having run for the presidency twice – in 1996 and 2000 – although with only modest success. The Russian opposition activist and writer Eduard Limonov, who leads the unregistered party The Other Russia, is also set to battle for the Kremlin post. He confirmed his plan at a media conference on November 21. Commenting in his LiveJournal blog, he wrote that putting forward his candidacy was his duty. “I said that I’m drawing fire upon myself and that I feel like a kamikaze, and that giving up without a fight in such historic elections is unacceptable,” Limonov wrote. He added that since all other opposition leaders “capitulated”, he would be the one to stand for opposition interests and expressed the hope that he would “win people’s souls”. The line-up could yet expand, as the presidential campaign was only launched on Friday. Under the Russian Constitution, not only nominees from political parties, but also independent candidates are allowed to throw their hats into the election ring. To be eligible, each candidate must collect at least two million signatures from supporters. An obscure fringe candidate, Nikolai Levashev, pipped Putin to the post on Friday, by submitting the very first application for the presidential poll. On his website, Levashev calls himself a member of the Complex Security Sciences Academy and the Academy of Family Medicine, and promotes “evolutionary development of children’s brains" as well as lessons in telekinesis. 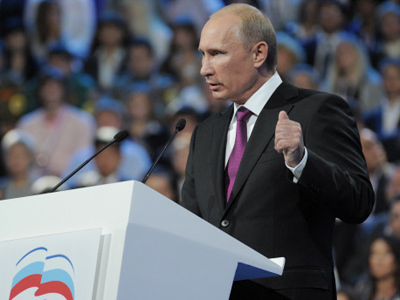 Putin and United Russia: a match made in November?